A Highly Important Tiffany Three-Panel “Magnolia” Window, circa 1910 (est. $400/600,000*) forms part of Sotheby’s Important Tiffany sale. 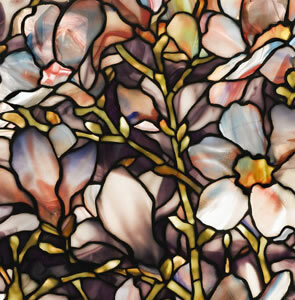 Tiffany Studios, A Highly Important Three-Panel “Magnolia” Window (detail). Circa 1910. Est. $400/600,000. Photo: Sotheby’s. As Julie L. Sloan writes in her catalogue essay, “this brilliantly colored, small jewel of a window required a bold and confident eye, as all of the modeling relies on the accidental swirls and ribbons of color within a single sheet of glass – no drapery glass or layering of glass was used in creating the piece. In addition, careful examination of the window’s pattern reveals it to be identical to a single repeat of Tiffany’s 28-inch Magnolia shade pattern, representing an unusual and possibly unique crossover between the lampshade and window departments within the studio.” Further, the window was included in the illustrious exhibition Masterworks of Louis Comfort Tiffany at the Smithsonian Institute in 1990. The selection of leaded glass lamps in the December sale is distinguished by the rarity, quality and value of the works on offer. This group will be led by A Superb “Wisteria” Table Lamp circa 1905-1910 whose model was designed by Clara Driscoll in 1901 (est. $400/600,000), A Rare “Trumpet Creeper” Chandelier circa 1905 (est. $500/700,000), and An Extraordinary “Laburnum” Table Lamp circa 1905 with a rare “Water Lily Twisted Stem” base (est. $300/500,000).